Korg's Triton LE series has evolved into the TR range, but does it deliver any more than a new paint-job? I've long been a fan of Korg workstations. Each model seems to progress logically from the previous one, cramming in playable, classy sounds and nailing the right blend of features and price. Yet the moment I began checking out the new Korg TR series, a strange sense of déjà vu settled over me. 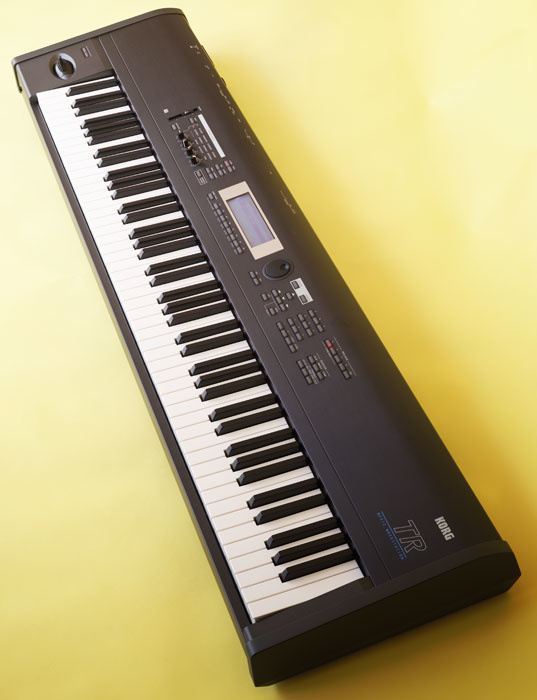 Four years ago, Korg released the Triton LE — a cut-down version of the hugely successful Triton. The LE offered fewer effects and no touchscreen; it dropped the internal power supply and omitted both the PCM and MOSS expansion options; finally, it relegated sampling to being an optional extra. The end result was a reduced-spec workstation that performed well without breaking the bank. Now the LE has been superseded by the TR series, which adds an additional 32MB of PCM waveforms, a USB MIDI interface, a more austere black paint-job and an SD-card backup slot. Will these enhancements be enough to breathe more life into the Triton range and beat off today's competition? On unpacking, I was struck by the more traditional appearance of the TR when compared to the futuristic silver of earlier models. At least it won't show the dirt! Other than the external power supply, I didn't find any significant compromises in construction: the knobs are a bit like what you'd expect to find on Korg's dance-orientated Electribe range rather than a higher-end workstation, but the buttons feel positive. As it was the TR88 88-note model that arrived for review, I was able to compare its RH2 (Real Weighted Hammer) action against that of my own Triton Pro X. RH2 is designed to simulate the feel of a grand piano, so key resistance becomes progressively lighter as higher notes are played. I have always found the action of my Pro X to be a little sluggish, so I quickly warmed to the improved feel of the TR88. If I had one wish, it would be that the lighter action of the upper keys could be employed across the whole keyboard. Realism aside, it's just more pleasant to play for extended periods, especially if you haven't pounded the ivories for a few years! At 21kg, the TR88 is far more transportable than my model, but still no lightweight. As per the LE, performance controls are thin on the ground with just a four-way joystick, two programmable switches and four assignable knobs to go at. Indeed, other than the colour change, the only visible enhancements are seen when you look at the rear panel. Firstly, there's a USB connector: before you get too excited, this serves only as a MIDI interface, so does not allow you to perform any USB audio functions. Secondly, an SD card slot is provided, capable of addressing cards of up to 1GB. Otherwise, the rear panel offers the usual stuff: external power connector, on/off switch, MIDI In, Out and Thru, stereo audio outputs, plus two individual outputs and assignable pedal connectors. If you fit the optional EXB-SMPL sampling board, you gain twin audio inputs and a SCSI connector. The headphone socket is at the front of the synth, sensibly enough. Adds a further 32MB to the Triton LE's original 32MB of wave memory, including stereo piano samples and lots of dance percussion. 512 Programs covering a broad range of sounds, 128 GM-compatible Programs and nine drum Programs, plus 384 Combinations. Optional EXB-SMPL sampling upgrade board adds sampling plus Time Stretch and Time Slice. One stereo insert effect plus two master effects and a three-band master equaliser. 61-, 76- and 88-key (weighted) models available. USB computer connection that serves as MIDI interface. With so little that is different, I wouldn't be serving you well if I recycled my January 2002 Triton LE review, especially as it's available to read on the SOS web site. Instead, I'll keep this brief and plunge right in without so much as a glass of wine or fumbled attempt at foreplay. The TR series' single greatest advance over its LE siblings is a doubling of PCM memory, from 32MB to 64MB. This memory is divided into two areas: the ROM area hosts the LE's original waves, while the EX area contains extra samples, some stereo. The memory is packed with usable material — no less than 470 multisamples and 518 drum samples. There are 44 multisamples in the EX area (although almost half of these duplicate percussion samples found elsewhere). Highlights include the stereo Bosendorfer piano samples previously seen on the PCM08 concert grand expansion board. This spacious, velocity-switched piano has served me well since it was released and remains perfectly playable and responsive to this day. The remaining multisamples are typical Korg fare: strings (ensemble and quartet), acoustic guitars, a lovely flute, an oboe, trumpets, voices, electric pianos and that perennial favourite, 'harmonica-wah'. All are absolutely fine although hardly adventurous. The EX wave area also contains 100 single drum samples, with a heavy emphasis on dance, especially kicks, snares and hi-hats; these are ably demonstrated in some of the new drum kits. As per the LE series, maximum polyphony is 62 notes, and if stereo samples are used this figure is reduced by half. The synthesizer architecture is unchanged from previous Tritons, so when creating a new patch you select a waveform or waveforms (if you're layering) from the ROM, EX or RAM areas, the last being the source of your own samples. You then process this source via 24dB or 12dB low- or high-pass filters and modulate the result with envelopes, LFOs, joysticks and so on. None of this was particularly radical when it was young and fresh, and here in 2006 it's definitely lagging behind its rivals. A healthy 512 User programs are provided in four banks of 128 (labelled A-D), with a set of GM patches and nine GM drum kits. A further 24 user kits are provided and, finally, there are 384 user Combinations — Korg's means of combining up to eight patches. The Combinations are arranged in three banks and filled with reminders of why the Triton has remained popular for so long. Expect lush pads, pianos and ethereal voices, along with highly creative uses of the dual arpeggiator — whether recreating strummed guitars, orchestral flourishes, driving basses or thumpy percussion. Apart from the feeling that Korg may have milked this particular cow dry, it's hard to have serious misgivings about any of the Triton family. They sound great, are full of sounds that most of us can use, are never too deep or complex and rarely have many wasted features. OK, I personally don't use the sequencer or the sampler in my Triton but at least with the TR you don't have to have the sampling option. Having played the TR88 for a few weeks now, I don't see it as an instrument that will create too many die-hard advocates. It delivers what you'd expect if you have prior knowledge of the Triton range and at a price that isn't quite in the bargain category. The additional samples and USB connectivity are small manifestations of four years of technological advances — especially since at least some of the samples are drawn from Korg's library of existing PCM waveforms. I have no doubt that the TR series will provide sufficient warm strings, breathy voices, pianos, drums and trumpets for many musicians — especially those who prefer sticking with what they know. However, comparing the TRs with recent workstation gems such as the Alesis Fusion, makes me wonder whether Korg have taken their eye off the ball. Perhaps now is finally the time to put the Triton range to rest and build an affordable 'Oasys LE' instead. Twice the wave memory of the Triton LE. USB MIDI and SD card storage. Fairly slim and compact for a weighted keyboard. Recycling the LE series fails to get the blood pumping. The TR88 is a capable workstation with a playable keyboard, classy piano samples and a fine selection of effects. But, hey, it's a Triton, so no surprises there. The problem is that we've already had the Triton LE — and the TR88 is basically an LE with a fresh lick of paint and some extra samples. Korg UK Brochure Line +44 (0)1908 857150.